Out with a bang! Wearing a dress for the last day of MMM. Holy cow, this month went by quick. Me Made March has come to a close and I am pretty darn proud that I made it through the whole month wearing one me made item each day. I did have to do quite a few repeats, but still... I thought for sure that I would lapse a few days. I'm so pleased that I didn't. Besides feeling a little narcissistic, how useful is it to see a photo of yourself everyday for a month? (I see I really need to stand up straight!) Almost everything I wore during the month is a shirt. That's funny considering tops are the smallest portion of my pattern collection (mostly dresses, fyi). That seems to be what I sew and wear handmade most often. I think it's because I find it so much easier to fit my top half, opposed to my bottom half. One of my sewing goals for this year is to make pants that fit. Time to get on that, I believe. I also discovered many me made things in my closet that are total failures. I've kept some things around that I really shouldn't. I've made quite a few skirts, but only have two that fit. I really enjoyed the whole experience. The best part- it wasn't that hard. It's nice to know that I can wear my me made things on a regular basis. I was comfortable and no one gawked and stared. Here are the rest of the photos from the month. Thanks Zoe, for organizing another great me made month! Day 23: This was the altered shirt dress from day 8. I wasn't completely happy with it as a dress, so I chopped it of and made it a shirt. I love this. I'm so glad MMM made me rediscover this dress. Day 26: My salvaged skirt. It's made from a cheapo cotton broadcloth. Better suited for summer time, I think. Brought this out from the back of the closet. Now can I get woot woot for not having to take a picture tomorrow? I was inspired by an art project I taught my kindergarten students recently. My little five year old artists learned that a tint is created when white is added to a color and a shade is created when black is added. Obviously, we experimented with tints and shades using the color blue. I love blue. We also collaged all sorts of blue things on our blue paintings while listening to the blues. The finished paintings were really beautiful. I was reminded of a quote that I read somewhere (and I can't remember where now) that what kids know about art, grown artists struggle to find. It's so true. I'm often in awe of the art they create. 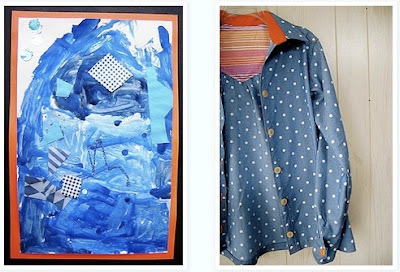 I mounted the blue paintings on orange paper and hung them out in the hallway. When I went home, sitting right on top of my fabric stash was a blue polka dot shirting and a bright orange broadcloth. Off to the side was a little scrap of stripey orange vintage fabric I found at Goodwill. I knew I had to combine the three. I decided I wanted to make a shirt- in fact, a shirt I could wear to work. I chose Vogue 7700 because I love the detail at the back on version C. And it kind of reminds me of a smock. Perfect for an art room. The polka dot shirting is a cotton blend. I used an orange broadcloth for the collar band and the vintage stripey scrap of fabric for the yoke facing. All of the top stitching is done with bright orange thread. The buttons are a light peachy color, though I used two bright orange buttons on the cuffs. (I ended up unpicking and replacing the button placket in case you were wondering about my earlier fiasco.) I took time to do everything right. I'm really proud of the craftsmanship. I even tried blockfusing the collar and cuffs after reading Sherry's post, which definitely helps with accuracy. Technically, this shirt is nice. In theory, I should really love it. It's okay. I really like the back. I like all the top stitching. Something is not quite right with the collar, though. It stands a bit too high. Or maybe the orange is too much. I may take off the collar completely and just leave the band. And overall the shape is a little too boxy for me, though I knew it would be this way when I started. Maybe I just need to figure out what to pair it with. 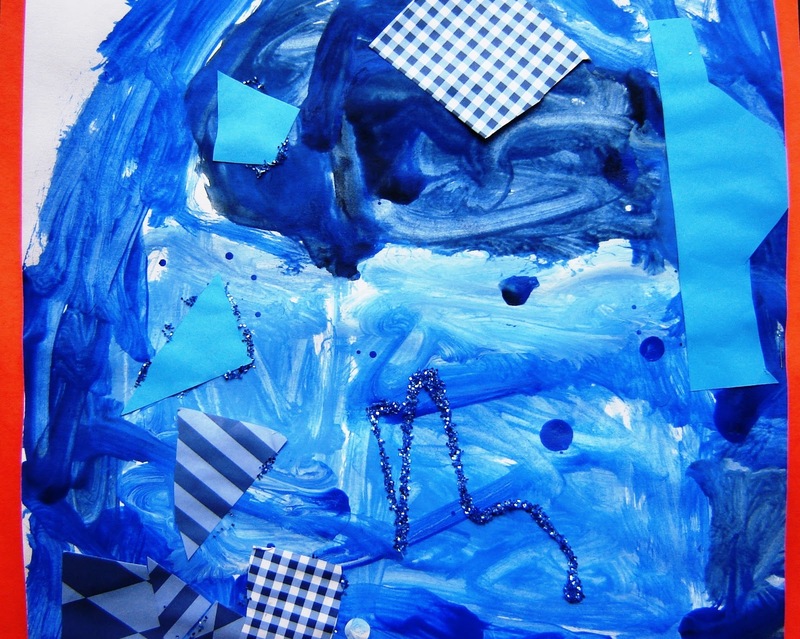 Would you like to make your own kindergarten blue painting? Kindergarten artists learned that a tint is made by adding white to a color and a shade is made by adding black. We spent one day painting, discovering tints and shades. 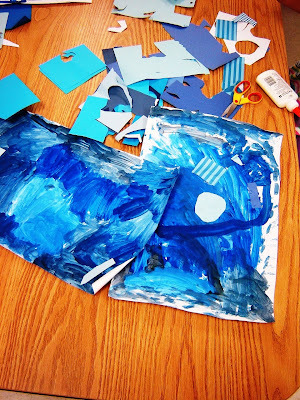 On another day, we cut shapes from all sorts of blue papers and glued them to our blue paintings. We even used a tiny bit of blue glitter -only reserved for special occasions. And yes, we listened to the blues, too (the Delta Blues station on Pandora). This is the face of someone who wants to bash their sewing machine. Also, Me Made March Day 20: McCalls 5241 cardi warp again. Let's just say things haven't quite been working out for me in the sewing room this week. I fully expected to have a finished project to blog about this weekend, but alas- that is not the case. In fact, I think I did more damage today by trying to finish something than if I had not sewn at all. This is what my sewing room currently looks like. I did cover those giant blocks of furniture foam- and they look terrible. I'm working on plan b. I think it may be best to leave upholstery jobs to the professionals. I bet you're thinking that this looks nice. I guess I don't know my own strength. I actually have the dullest seam ripper in the world. I'm amazed that it tore through the end stitches. And last but not least, I bought the most beautiful pale aqua eyelet to make a spring dress. I also bought a bright red and bright orange cotton lawn for a lining. I couldn't decide between the two. Then, I threw them all in the wash together like an idiot. I'm not ready to give up on the eyelet yet. I think I may try to over dye it a deeper turquoise. I'm hoping it will cover up the red and orange stains. Does anyone know if this will work? Or have any other suggestions? Day fourteen: Striped Simplicity 2865 again. My shoes are now two different colors because I spilled ceramic glaze on one. Day sixteen: A fleece coat I've never written about, McCalls 5714. I made it a long time ago, early on in my sewing adventures. I wear it often, though the interfacing I used feels like cardboard. I caught a delightful 24 hour bug, I'm sure from a kid at school, and stayed home from work. And, no, I did not feel like taking a photo of myself. Day nineteen: Simplicity 3833 made from a double knit. This was the first public outing for this dress even though I made it a while back. I didn't realize how much I liked it. It was three sizes too big. I took it in at the sides. Not so happy with the length. I think I'll make it much shorter and wear it with leggings next. This is not the most exciting post in the world, but I thought I should keep up with my me made madness here on the blog. I really thought at this point that I would run out of options, but I haven't (yet). I've made three knit tops in the past week. Seems to be the quick, easy and wearable option. I made another version of Burda 106 2-2011. I used the same Michael Miller interlock in a black and white polka dot but this time I didn't pay any attention to the direction of the grain. I was in a hurry. Turns out the stretch needs to be in the width, not length. It fits, though it's not the most comfortable top to wear as there is no give. Live and learn, right? This picture was taken when it was almost completely dark. It's kind of eerie, isn't it? I also made a short sleeve version using an old skirt that shrunk down to doll size in the wash. It was a long, sweater knit skirt. It was basically just a tube of fabric with an elastic waist band. It has an incredible amount of stretch so I omitted the seam allowances. I had barely enough fabric- another reason for skimping on seam allowances. There were only a few tiny scraps left. I'm not super happy with it. It's a strange fabric for a top- heavy and clingy. It's amazing how different knits are and how they can affect the outcome of a pattern. It's good for bumming around the house, which is what I did today. Not the easiest thing to wear in an art room! I wore an apron over it most of the day. These are becoming a staple. I may have to make another pair. Day thirteen: New Burda 106 tee. I've got a few big things in the works at the moment. I'm working hard on a furniture project for a friend and I've got a few items that I'm very excited to write about soon. Wishing everyone a wonderful week! One of my Christmas gifts was a subscription to Burdastyle magazine. I've made Burda patterns before, downloaded and printed from the website, but never actually traced one from the magazine. Holy cow. If you haven't seen one of the pattern pages, be prepared for something like the above photo. The effect is dizzying. I waited with baited breath and received the first issue in February. I flipped through it totally psyched about all the magnificent things I was going to make. After checking out the pattern pages, I decided my first go around should be something simple and easy. I decided to make the long sleeve tee, number 106 B, after seeing the stripey version in the magazine. The instructions pointed me to blue pattern line, sheet D, pattern pieces 21 to 23. I went to pattern sheet D and saw loads of blue lines and no number 21, 22 or 23. Hmmmm. I found a blue line and decided to trace it. I mean, they wouldn't make two patterns in a blue line on the same page, would they? How do you trace Burda magazine patterns? What sorts of materials do you use? How do you find the right pieces? Will tracing Burda patterns make me permanently cross-eyed? And where in the world are the pattern piece numbers? Matching neon pink and orange stripes will cause temporary blindness. This was my MMM day two outfit. I've already made another knit top from the same pattern but didn't pay attention to the direction of the stretch. I'll wear it, too, though it's quite a bit tighter. I've read about 2 way or 4 way stretch before but have never paid much notice when sewing knits. I've learned my lesson. Day seven: Pink and orange Burda top again. I know. Again already. But, I have an excuse. I work at a different school on Mondays, so if I can repeat clothes any day, this is the day to do it. I woke up totally uninspired today, hence all the black. I'm glad, though, because I ended up with dried crusty Elmer's glue all on one side of my sweater and blue paint on my bottom (I sat in it). At least it wasn't on any of my me-made things. I, Liza Jane of lizajanesews, sign up as a participant of Me-Made-March '11. I endeavor to wear one handmade garment each day for the duration of March 2011. I'm going to count refashions as handmade, but I only have a few of those. I'm signing up because I love wearing things I make and I don't do it as often as I should. Usually when I'm wearing something I've made it means I've put a little thought in to getting dressed that day, rather than throwing on my usual uniform of corduroys and a knit top. I'm interested in where the holes in my wardrobe lay (or is it lie?). This will be a good way to figure out what I need to sew next. I'm a little apprehensive about all of this because I'm not sure I can make it through the whole month. Also, everything I wear to work inevitably ends up with paint on it (my favorite pair of red pants met their demise recently when a five year old crashed in to the back of me with a very wet painting). I won't be wearing my nicest things except on weekends. But, I am curious if I can hang. I'm going to try my hardest. 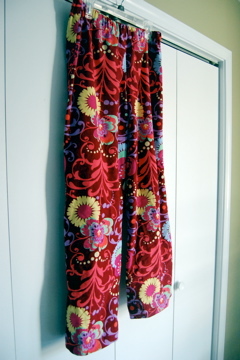 Forgive me if some days I count my handmade pajama pants. I'm also worried about taking a photo everyday. J was obliging today but I may have to get creative other days. I won't be blogging daily, but maybe I can do a weekly round up. The shirt I wore today was made by me last year (pre-blog) but I did post it on Burdastyle. McCalls 5433- the envelope claims it is a 3 hour shirt. The fit is fabulous but boy did it take a lot longer than 3 hours. I love this shirt and wear it often but the sewing is absolutely horrific. There is crazy, wobbly top stitching on the placket, the cuffs are coming apart at the corners and the button holes are so small that I don't undo the buttons anymore. I just slip it over my head. But I love it just the same. Maybe I should make another now that my skills have improved. Do I need to talk about the rest of what I'm wearing? I feel a little silly, but pants are from Talbots and they are not black but a really deep midnight blue. And you'll see my blue Dansko's often. I have several pairs and they are about the only shoe I can stand to wear at work. I *never* sit down. Looking forward to seeing what this month brings!